As sole designer and brand builder for this sophisticated, kid-centric, organic frozen yogurt concept, I brought an intensely collaborative process to the project. Working closely with the founder, I defined the core values and mission of her company, crafting and executing a complete identity package and messaging platform for use across all collateral, digital presence, social networking, hiring content, and, ultimately, the retail experience. 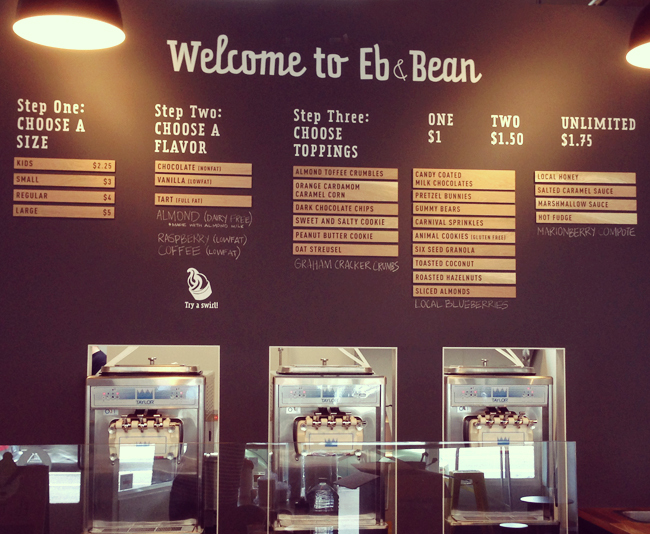 "Eb & Bean welcomes tiny tots, grown ups, and every playful taste bud in between. We source our organic dairy from nearby farms, and work with local confectioners, bakers, and growers to offer awesome toppings that appeal to “treat tooths” of all ages." Having established a vision, mission and positioning for the concept, along with extensive mood boarding and inspiration work, the Eb & Bean logo emerged as a bespoke mash-up of font styles created to be accessible, clean and welcoming. A playful ampersand and poppy colors round out the visual. A core illustration was created by an artist who I directed to create a friendly polar bear that would be the mascot of the brand. Youthful but not too young, playful but not mischievous, the bear strikes a balance of neutrality and warmth. Printed collateral reflected the refined approach of the business - that of extremely high quality ingredients and toppings that an advanced palate would appreciate, with the fun and creativity that a kid would go crazy for. An easy-to-update website incorporates the brand's promise, a rotating menu of flavors, and beautiful photography, which I concepted and art directed from start to finish. A flexible menu in the retail space was required for weekly, if not daily, updates. The wall was treated with magnetic primer and chalkboard paint and modular, engraved-wood plaques were used to represent the often changing toppings and flavors. Bringing the brand to life, I also assisted in the interior design of the retail space, creating a colorful pattern for the POS, a focal point of the space.